According to Gladwell, the Power of context infers that epidemics are sensitive to the conditions and circumstances of the times and places in which they occur . This is a main idea within lateral marketing, because it involves an important transformation of a product or service: there must be the radical addition of a use, situation, need or target that had not existed ever before (http://www.gladwell.com/tippingpoint/guide/chapter4.html). 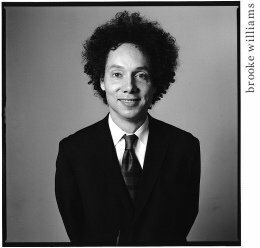 Malcolm Gladwell. Photo Credit: Brooke Williams. 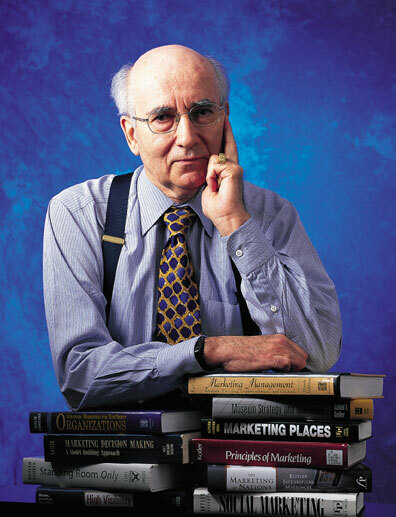 While vertical marketing consists of modulations within a given market, lateral marketing restructures markets by creating a new category through new uses, situations, or targets with the appropriate changes in a product (Lateral Marketing, 2003, Kotler and Trias de Bes, p. 75). 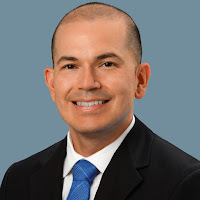 I found it really interesting that Kotler and Trias de Bes state that lateral marketing is a complement of vertical marketing, because lateral marketing works in the areas where vertical marketing does not. Throughout the first four chapters of Lateral Marketing, one gets the idea that lateral marketing should completely replace vertical marketing. In chapter 5, the authors make it very clear that both types of marketing are complementary and necessary. Fernando Trias de Bes. Photo Credit: Ana Jimenez. 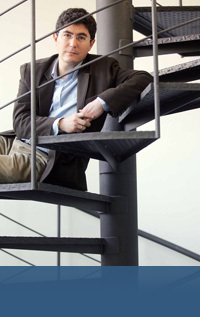 One generally accepted assumption for Gladwell, Kotler, Trias de Bes is that all kinds of high-tech products fail, never making it beyond the Early Adopters, because companies fail to transform an idea that makes perfect sense to an Early Adopter to one that makes perfect sense to a member of the Early Majority (http://www.gladwell.com/tippingpoint/guide/chapter6.html). Most high-tech products fall under the lateral marketing area and require a greater effort on consumer education. Consumers can assimilate and adopt more readily vertical marketing innovations because they fall within their comfort zones. The last statement ties in directly with the “Stickiness Factor”. There are small but critical adjustments in how we need to present ideas to the average individual, so that we can overcome the weaknesses from these ideas and make what we have to say memorable. An example: Both Investopedia.com and Fool.com seek to educate all investors, from novice to advanced, because they believe that the key to success in investment banking is the access to information and that is why, online investing education sites offer a variety of glossaries, investing tutorials, articles, tools to calculate return on investments and investment simulators. The main objective is to have a better understanding of how the financial market operates so that individuals can maximize their potential profit and minimize their risks by becoming aware of potential hazards in investing. This is all nice and fine, but it completely misses the other two rules to start an epidemic, “the stickiness factor” and “the power of context”. Both educational sites miss “a simple way to package information that, under the right circumstances, can make it irresistible” (Gladwell, 2002, p. 132). Screenshot of Investopedia.com in January 2005. Throughout many years these two websites failed to become “epidemic” because they failed to: identify the level of expertise of the investor; create as many hyperlinks as possible; recognize that most users on online education websites already hold some education about investments; put everything into the context of the investment industry (because the goal of online investing education is authentic learning); and provide training material for the certificates, licenses and other forms of legitimization that the investment industry requires. 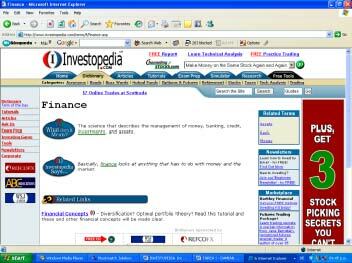 Another screenshot of Investopedia.com in January 2005. A great area of opportunity for the investing education sector was the gap between what takes place in educational practices and what takes place in current work practices, and this creates an educational gap. Gladwell (2002) refers to this as the “Power of context”. Both Fool.com and Investopedia.com realized that even though it was necessary to expose the novice learner to the industry vocabulary, the two main goals of an online investing education website should be (1) putting vocabulary in context and (2) reinforcing the trust of the community in its non-material elements. This is called authentic learning and it specifies performance standards in a profession. Therefore, it was necessary to develop more articles and tutorials about industry practices and specific industry skills like due diligence, portfolio management and professional certification. 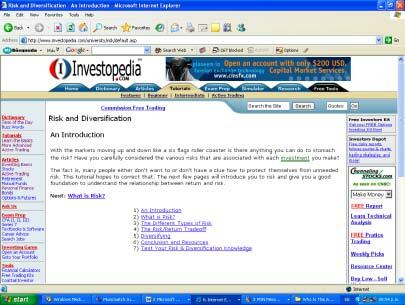 Partial screenshot of Investopedia.com in October 2008. 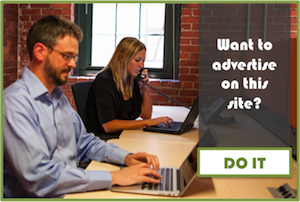 So, did these sites follow this advice? Daily unique visitors of Fool.com (blue) and Investopedia.com (red) according to Google Trends. For many years, Fool.com had a clear advantage over Investopedia.com. However, the graph above clearly shows that Fool.com has lost visitors, while Investopedia.com has a steady upwards trend of daily unique visitors. To minimize the asymmetry of information in the areas of Finance and Investing, there should an increase in the teaching-learning practices that use the concept of a community of practice to diminish that asymmetry. The investing sector is a community of practice that uses authentic learning to develop learning activities that are similar to those that take place in the current practice of finance and investing, which it is assumed that he or she wants to take part of later in the future. There have been important advances in the field on online investing education but there is yet much to be done.